I received an email from a reader saying that she was 76 years of age and needed a medical alert while at home but that she had no landline, just a cell phone. I had also been wondering about something similar, as I have a home alarm system and wanted to cancel my home phone. I thought I could not because of my ADT system. I did some research and made some calls and found out that yes, you can have both medical /emergency alert and home alarm even when you have no landline. HOWEVER, in the case of the home alarm, replacing the alarm with the wireless option is not always cost-effective. I am 2.5 years into a three year contract with ADT, so I called them first. The cost for its CellGuard wireless system, despite my already having an ADT system, is $239, and then the monthly fee increases by $10 forever. Since I have already cut my home phone back to just the basic local service, my landline is now a mere $19 a month, with a Century Link promise not to raise that for five years. I therefore would only save $9 a month, and incur an upfront cost of $239. It would take me more than two years to recoup my money doing this. I have decided to keep my landline, at least until my ADT contract expires in February. There is at least one other wireless option, however, and while I haven’t tried it and don’t know anyone who has, it is surely less costly. SimpliSafe is a wireless system that talks to local cell towers. It is so easy to install that they send it and you do it yourself – so there’s no install fee. The hardware itself is $169-$269 depending on whether you want the version that allows you to work it remotely from your smart phone, and also have it check for fire, flood and carbon monoxide. Then the price starts at $14.99 a month. If you want to add services such as email and SMS alerts the price is $19.99 a month. The full package, the SimpliSafe 2 with the fire and carbon monoxide warnings as well as freezing alert, is due out this fall , and will add about $5 a month to the cost. So you’ll pay several hundred less upfront compared with ADT, about half what you pay to ADT each month, and you will have no contract to sign. Again, I caution, I have not tried this system and have no personal testimonials I can trust either. Here are the details and some media coverage. For medical alerts there are some nice options however. LifeAlert has what it calls a 911 mobile phone, which is basically a one-button 911 wireless device that you can carry anywhere. It works anywhere within the U.S. and its battery is supposed to last at least seven years. 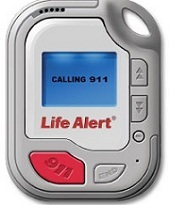 Additionally, LifeAlert offers an emergency system that ties into your own mobile phone. All it takes is the touch of one key and you’re on the phone with a LifeAlert responder, to report an intruder, a fall while hiking, someone following you back to your car or any other emergency. What I don’t like about Life Alert is that its site keeps pricing a deep dark secret and when you phone the 800 number splashed everywhere you get a call center rep whose sole job it is to get your address to send out a free printed brochure. I found no evidence of any Facebook page, or other social media presence. The company just seems really out of touch with today’s boomers and seniors, and for a firm that is clearly targeting a younger audience with its emergency mobility, its product marketing is dismally out of date. 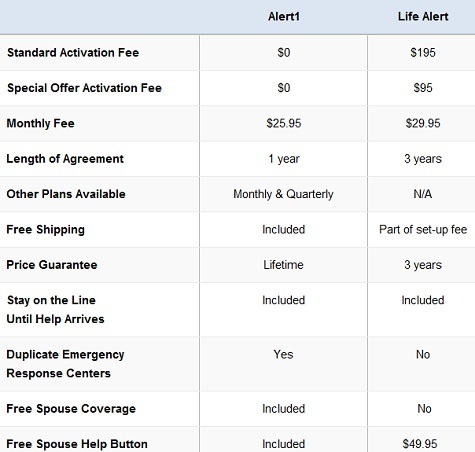 Alert1, a competitor, posted this pricing comparison (see graphic below) between it and LifeAlert, and assuming accuracy, here’s a brief glance at LifeAlert pricing for its standard products. What is not made clear, however, is that not all Alert1 differentiating products and services are available when you choose the monthly and quarterly billing option it touts. Alert1 does not seem to have a wireless option. Another wireless medical alert option, which I’ve been impressed with for a long time, is the Jitterbug cell phone. Yes, it might be bigger than something you want to carry around with you from one room to the next, but if you need both a mobile phone and a medical alert system that is wireless this would fit the bill. The phone is well-suited for those who are elderly, hearing impaired or suffering from cataracts or other sight difficulties. The keys are very large, and the phone works well with hearing aids. But it also can be programmed as a medical responder. It’s 5 Star Urgent Response, for $14.99 a month, brings emergency help with the touch of one key. No contract is required for either the phone service or the 5 Star add-on. Jitterbug also has a 24/7 Nurse line app as well as one for medication information. Keep in mind, however, this is NOT a smart phone. If, like me, you want to be able to check your email, send a text, get directions, use your calculator, make notes, and take a picture via your mobile device, the Jitterbug is not for you. At least not as your only mobile device. UPDATE – Since I first posted this, I’ve learned of another medical alert product that can work without a landline phone. MyPersonalResponse.com offers a choice of two landline systems that vary by range and a cellular system. The most costly, the cellular is $29.95 a month, with no contract and free shipping. There’s an offer on its site for a free first month. You install it yourself.